Remember how the 90s kept reminding you to not have a cow? Well, we couldn’t agree more! Don’t, under any circumstances, have a cow. BE a cow. 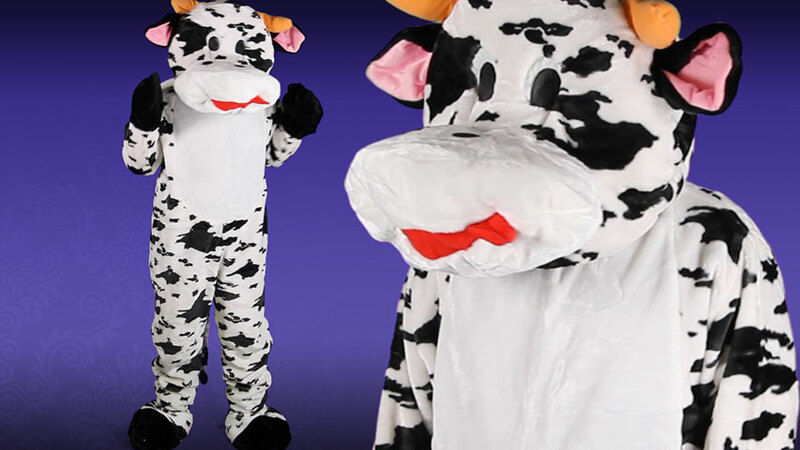 BECOME a cow and we think you’re likely to be a hoof ahead of the trend. Everyone knows that cows are bound to become the next “hip” animal craze. A few years back it was owls. Then foxes hit the scene. Porcupines had their heyday, followed closely by hedgehogs. The industry flirted with screen prints dinosaurs and unicorns, and we’ve recently seen an uptick in octopuses. In the end, they say it’s always a safe bet to put a bird on it...BUT...we predict that this year will be the year of the cow (not in the Chinese zodiac way, in the fashionable craze way). So we guess the only question is: do you want to be a trendsetter or trend follower? We’re glad to hear it, trendsetter! 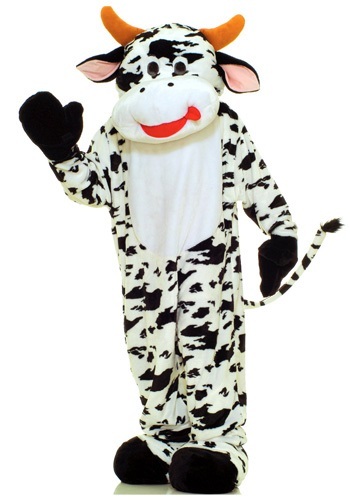 You’ve chosen well with this Mascot Cow Costume. It is cute and cuddly and oh-so-up-to-the-minute. It’s also really simple to wear! You just zip up the soft jumpsuit and and let the attached tail, stuffed face, and plush hooves transform you into a bovine sensation on the moooooooove. The only trouble is, with such a great disguise, how will everyone know who this savvy costume belongs to? We’ve thought of that. Pick up a cowbell and write your name nice and big on it, so everyone can give you credit later on when they are stocking up on cow-printed baby onesies, buttons, and backpacks!